Three simple words that will sum up Batman to the highest degree. 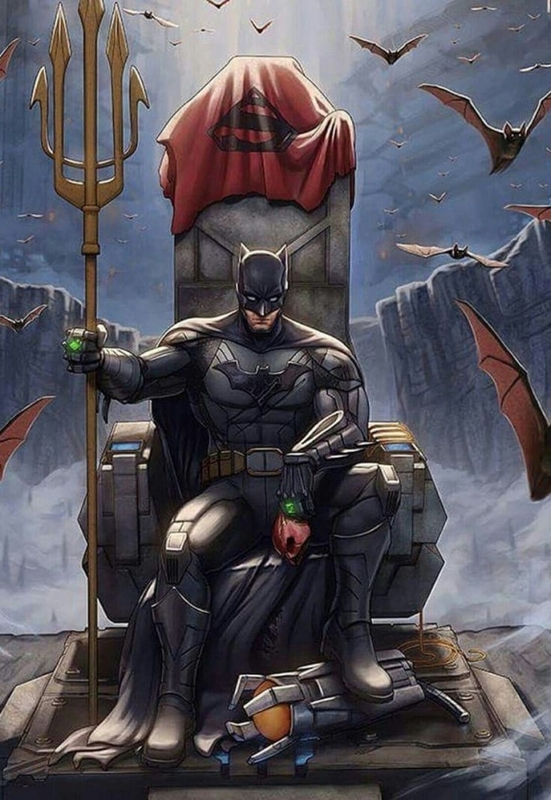 Standing beside an alien who walks as God's on Earth, an immortal Amazonian Demi-Goddess, the worlds fastest man, a cyborg and more, Batman will always hold his own, keeping his contingency plans to the highest degree. He is a man, sure, but one that will never back down from a challenge; that will hold his ground against any and all enemies that stand between him and saving his city. Often challenging aliens and God's that would otherwise destroy the world, Batman will find and discover the best way to beat them. For that reason, there's no surprise that he's the greatest hero out of the lot. His infinite wealth his only source power, giving him the resources to create, construct and learn various machines and tactics to shatter his enemies. It's often said that Bruce Wayne is the mask of Batman, unlike Superman's Clark Kent or Wonder Woman's Diana Prince, who hide in human form. And where they have had years of training their powers, he holds his gadgets above all. And what stands out most about Batman is his humanity. Understanding how human's work, that giving is better than taking and that what the does is not to benefit himself but to benefit those who trust him, those living in Gotham (often even the world) and doing his best to save them no matter the cost, is his greatest power. He is a complex, emotional person, hiding behind two separate egos that benefit the world in their own unique ways. If there was only one comic book character that could benefit this world, it would have been Batman. A wealthy man, powerful man, who was a beacon of justice, holding the values of those he cares for higher than wealth and greed, who could turn the world into something useful. He is incorruptible and holds the greater good of the world above all. There is no one better to strive to be than Batman. Though he's not immortal, the message he stands for is. Standing out from the crowd who do it for their own personal reasons, Batman tries to bring the world together. The death of his family caused a great shift in him. Instead of damaging and breaking Bruce Wayne, it changed something inside him to become this pillar of hope. And to think, a character created all the way back in 1939, has been able to inspire me, as well as hundreds if not thousands more to live their lives as best they can. Giving and helping their communities as best they can, with whatever they can. Having infinite sources of money is not the only thing Bruce Wayne or the Batman can teach help the world, it's becoming a member of society that can show strength and honor in every day to day dealing. Help those in need, become a man that could inspire change in those around you. Dr. Destiny: You Don't Have Any Special Powers! Batman: I have one, Johnny. I never give up.